Have a great web marketing campaign that'll guarantee your online business to grow. We analyze your product together with your website so you can improve not only your online positioning but also your image, to reach every customer out there. 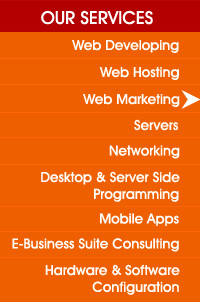 � 2011-2013 TrySmart Solutions. All Rights Reserved.